Mayor Ko Wen-je attended the A Hundred Golden Melodies to Usher in the Tenth Billionth Metro Rider concert at Daan Park MRT Station in the afternoon of March 30. Ko remarked that 23 years have passed since the Taipei MRT began operations in 1996, and the daily passenger volume has since grown from 40,000 passengers to 2.1 million. Taipei’s MRT has become part of the daily lives of residents, and indeed their pride. He expressed his hopes that the MRT would continue to serve passengers and march toward its next ten billion passengers. The mayor said that the MRT has many characteristics that make Taipei residents proud. When abroad, people will tell him how bright and clean Taipei’s subway is, how everyone lines up for boarding, and how passengers make the blue priority seats available for elders on the train. Ko Wen-je pointed out that the Taipei Mass Rapid Transport Corporation (TRTC) is thinking about ways to add more culture to the city of Taipei. He cited the example of the Zhongshan Metro Mall, which has become a symbol of Taipei's standard of living with the help of Eslite Corporation. Moreover, TRTC has long supported street dance events and contests. In recent years, the company has added art to many stations to compensate for the lack of attention to aesthetics and art in the original design and construction. He pointed out that if you consider the fact that each MRT station is expected to last for a hundred years’ time or longer, aesthetics and art deserve much more attention. Therefore, each year, the agency will select a number of MRT stations for improvement. This seeks to gradually enhance the system’s cultural and artistic level in order to make the Taipei MRT look ever more beautiful. According to the mayor, Taipei MRT President B.C. Yen told him that data indicated the arrival of the 9,997,577,201th passengers on March 29. The ten billionth passenger is expected on the morning of March 31, at which point the Taipei MRT will immediately announce the ten billionth rider’s card number. Therefore, MRT riders are advised to pay attention tomorrow: anyone may be the lucky ten billionth passenger. 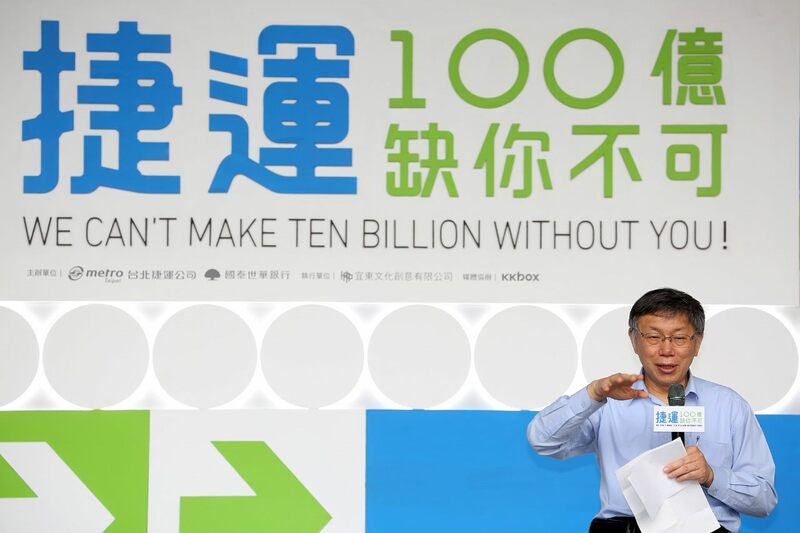 At the end of his remarks, Ko Wen-je expressed his hopes that TRTC would continue to work hard and march toward the next ten billion passengers.